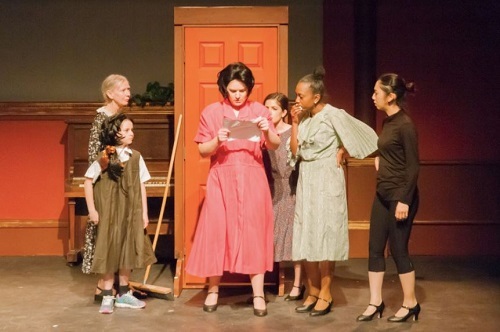 Playing at the Alumnae Theatre in Toronto’s Distillery District, Queen Marie is an engaging musical tribute to “great big girl” Marie Dressler. Dressler, whom I knew nothing of previously even though she won an Academy Award and acted with Greta Garbo and Charlie Chaplin, was an Ontario-born comic actor whose theatrical career spanned decades, right into the first “talkies”. I enjoyed watching Dressler age and evolve throughout the years. A child actor (Tess Keery) plays her as a spunky five-year-old playing cupid in tableau with wings on her back, as coached by her mother. Ten actors play her in different stages in life, until we see Dressler celebrate her 63rd birthday as a movie star. Her plump figure and black curly hair remain constant characteristics, making it easy for us to spot her on a sometimes crowded stage. The only downside to having Dressler played by so many different individuals was that I personally found that the accent wasn’t always consistent. Dressler’s action-packed history is further evoked by images projected on the backdrop of the stage. We see theatre and movie posters that move us along with her filmography, as well as different types of scenery that root us time and place. The band members, who remain in view on the left side of the stage, do a beautiful job of setting Dressler’s life to music. As for stand-out elements of Queen Marie, I particularly appreciated the earnest theatre announcements pronounced by the Boy (Jessica Bowmer). I also felt engaged by Dressler’s protective maid Mamie (Fallon Brown) and loyal writer friend Frances (Katherine Cappellacci). The costumes were a feast for the eyes. The flappers were particularly stunning, transporting us back to the Roaring Twenties. My favourite scene, thanks to the energy and creative staging, was a scene involving a train ride. 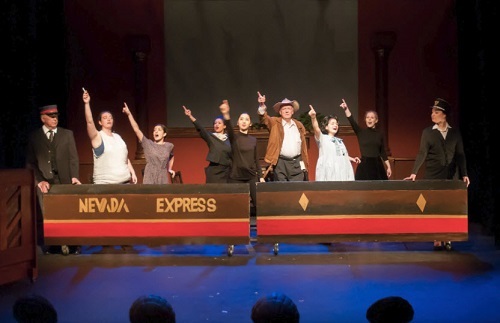 Dressler, as a teen, travels with a troupe for a few dollars a week, and her fellow cast members dance a great number with chairs in their hands, which then become train seats. I loved the momentum, the passion and the amusement. The life of Marie Dressler captivated me. She was a tireless actor who evolved through vaudeville, Broadway and film, who I wish made better choices in love and in money. Despite many hard knocks, she kept rising and evolving with the entertainment industry. She even made the cover of Time magazine in 1933. I went home promising myself to watch her talkies! All in all, I would highly recommend seeing Queen Marie for Dressler’s fascinating and inspiring life story.